The Banque Commerciale Du Congo (Congo Commercial Bank) and Tout Puissant Mazembe are part of the same team, the team of economic and societal players seeking excellence. 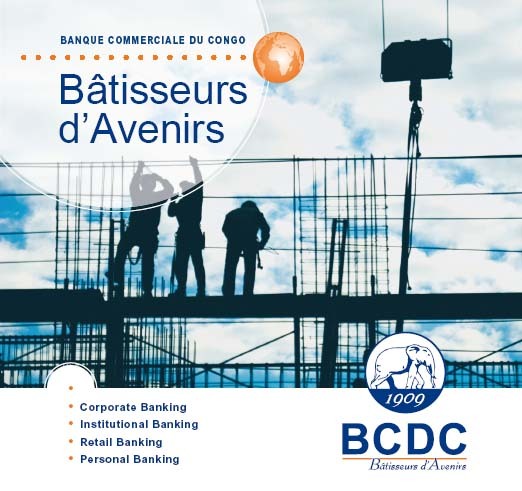 Throughout its existence, BCDC, a reference in banking in the DRC has shown creativity in backing all the country’s economic development players, with the courage that characterises Builders. Its thorough knowledge of the country is a permanent source of inspiration in the service of a business project that promises a shining future to all of its stakeholders. Elephant-like strength and the transparency of its commercial relations are the cornerstones of its confidence which is also based on a permanent respect of banking rules. In this way, the BCDC DARES TO BE DIFFERENT with its expertise controlled with the serenity of a healthy and balanced business. Let us work alongside our customers and our partners to build futures ! - The BCDC has been the reference for banking in the Democratic Republic of the Congo since 1909. With its contribution of USD 258.5 million in 2011 towards financing the economy, BCDC is the preferred banker and financial consultant of large Congolese and international companies, institutions, SMEs/SMIs and individuals. - The BCDC maintains and develops a network of 19 agencies spread over the territory of the DRC. - As a partner of Western Union for money transfer, the BCDC has 29 offices on its national territory. - The BCDC is strictly and rigorously governed. - The BCDC supports an ethical approach. Its basic values are integrity, loyalty, objectivity, confidentiality, candour, honesty and transparency.